This one is quite a ride! I became exhausted every time I picked up this book. It’s ending was good, but getting there was quite a roller coaster. I started to put it away several times because of the conflict, but after I’d relaxed a little, I picked it up again. I will say that if you start this you need to be prepared to listen closely. There is no written agenda. 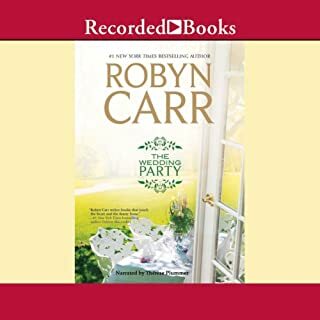 In true Robyn Carr style, the ending was great. 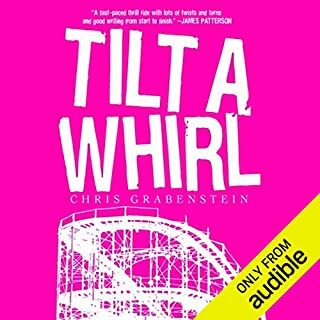 The narrator in the story is excellent. He really lends credibility to the characters. The beginning of the story is quite interesting. It has a setting for an intriguing mystery. Until the very end I was really enjoying the story. However, I wasn't very happy with the ending. I thought the ending should've been written more closely to resemble the style and flavor of the rest of the book. 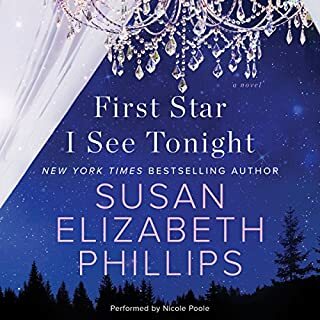 I won't read it again as I do with most of my books, but I will download the second book in the series and give it another chance. 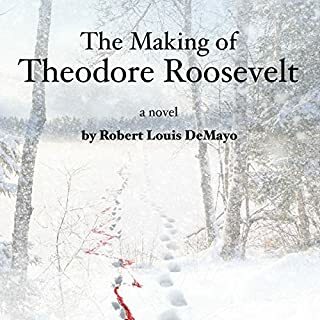 This a fictionalized account of a true story - the tale of how two rough Maine woodsmen took a young Theodore Roosevelt under their wing in 1878 and introduced him to the beautiful but unforgiving woodlands of the Northeast. Under their guidance, the frail but strong-willed New Yorker becomes a worthy outdoorsman, an experience which significantly shaped the world view of the man poised to become the 26th President of the United States thirteen years later. Aurora Teagarden is basking in the news of her pregnancy when disaster strikes her small Georgia town: four kids vanish from the school soccer field in an afternoon. Aurora's 15-year-old brother, Phillip, is one of them. Also gone are two of his friends and an 11-year-old girl who was just hoping to get a ride home from soccer practice. And then there's an even worse discovery - at the kids' last known destination, a dead body. Aurora Teagarden books are at the top of my favorites list. 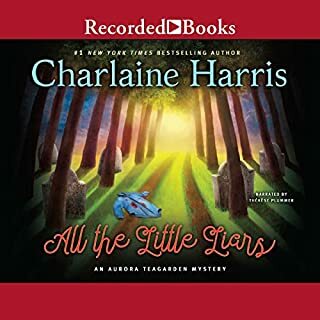 I was truly thrilled to see that Charlaine Harris had written another. I've read all the previous books several times. This will be the same, I'm sure. I hope there will be still another of Aurora's adventures. Will we get to meet the baby? Therese Plummer is a narrator beyond compare. I could listen to her forever. She brings such perfect emotion to the books that she reads. Great job! Piper was a very intriguing character, but Coop lacked the charm of most of the other stars men. Although this is not one of my favorite Stars stories, it was still charming and pleasant hours of listening. 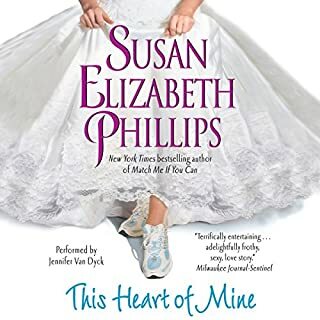 I hope Phillips does another Stars book--maybe with more of the humor of Match Me if you can, or This Heart of Mine. This is my fourth listening of this book. I really enjoy the development of Nightingale Woods. And nobody read them like Anna Fields. I miss her voice. I have been standing on the side of life, watching it float by. I want to swim in the river. I want to feel the current. So writes Mamah Borthwick Cheney in her diary as she struggles to justify her clandestine love affair with Frank Lloyd Wright. Four years earlier, in 1903, Mamah and her husband, Edwin, had commissioned the renowned architect to design a new home for them. Could have been a little less "dry." 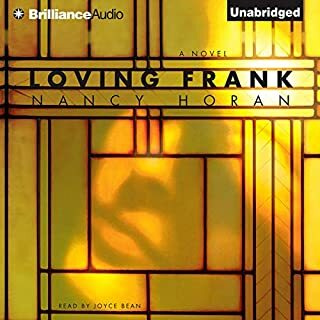 Would you try another book from Nancy Horan and/or Joyce Bean? I don't think I will ever search out another book by Nancy Horan. However, if someone recommended a specific book by the author, I would read it without hesitation. The writing was a little rough--transitions weren't always smooth, vocabulary was a pretty limited. I have not listened to any of Joyce Bean's work before, but I did enjoy her voice and style. It is quite clear and soothing. I found it a pleasant listen. I found the way that the children's situation was described--or NOT described--to be distressing. It is as if the author was as insensitive to the children's needs as were the characters. However, the descriptions of Frank Lloyd Wright's work, his habits, and his personality were interesting and revealing--not what I thought I knew about Wright before reading the book. While the topic was interesting, it doesn't meet the standard of romance and poignancy that, Bridges of Madison sets, although the topic is quite similar. Still in all, it might make an excellent movie with the right screenwriter. The social implications of this story are quite sobering, knowing that it was real as opposed to fictional. I don't think the situation would gain the notoriety in this day as it did in the early 1900's. It is a common tale today, which might help explain the weak character of such a large portion of our 21st century society. Where does Curiosity Killed the Cat Sitter rank among all the audiobooks you’ve listened to so far? I've listened to hundreds of audiobooks. I listen to my favorites again and sometimes again. To me it's like listening to music. We don't just listen to songs once and say, "Oh, I've heard that before." I listen to good audiobooks more than once and repeat good videos. 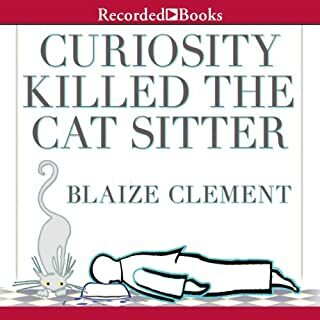 On the scale of 1 - 10 of audiobooks I listen to again, I'd rank Curiosity Killed the Catsitter as a 9. The story was creative and both funny and poignant. The narration was excellent. The pet parts really added to the interest. I had a little trouble hitting that pause button. Throughout, there was just enough information given that I always had an idea of where it was going next. I was surprised some, but that's great, because anticipation is an enjoyably involving aspect. Julia Gibson has one of those voices that make me feel very comfortable. The inflection in her reading is very natural. When she is frightened, she sounds frightened and the speed and intensity of reading speeds up. Her different voices sound like different people, and natural rather than affected. When she reads, I almost feel like she is right there in the room with me telling me the story. Yes. In fact I was glad that I was in a position to finish it in one weekend, which I did. I carried my iPhone around with me as I did other things and just kept this going. I am a voracious reader. I love the written/spoken word. Fiction or non-fiction, reading is always my "downtime" activity." I've been in a shift toward audio over the past 10 years. I loved being read to as a child. 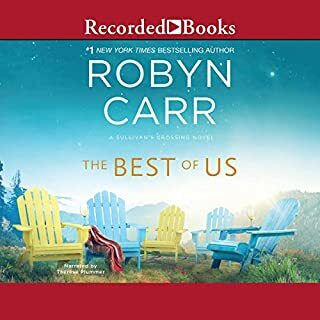 I now find that listening to a really good narrator read me a story is a very comforting experience--whether the book is a romantic comedy, a mystery, or a thriller. I get lost in the story that I'm listening to. This one was a pleasure indeed. Can't wait to listen to Duplicity Dogged the Dachshund! 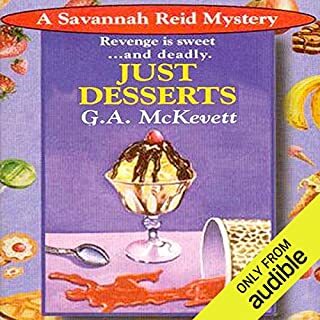 Would you try another book from G. A. McKevett and/or Dina Pearlman? It was almost painful to listen to this recording. I gave up on the audio about 1/3 of the way through. I got the large print version and finished it. I enjoyed the story and will look for more McKevett novels, but I won't buy another book performed by Dina Pearlman. What was one of the most memorable moments of Just Desserts? The scenes where Savannah had the confrontation with her supervisor which ended in her dismissal was pretty good--well, bad for Savannah, but well written. At the time that I listened to that I knew it was going to be a turning point in the story. Could you see Just Desserts being made into a movie or a TV series? Who should the stars be? I think this has great TV series potential. I love to see Emily Deschanel from Bones or Katee Stackhoff who plays Vic in Longmire play Savannah. I think as a series it has the potential for fast action. In the book, the great descriptions of character and settings make it very interesting and realistic. I really enjoy that aspect in a book. However in video format that would all be visual, and therefore faster moving.